Took this photo yesterday. 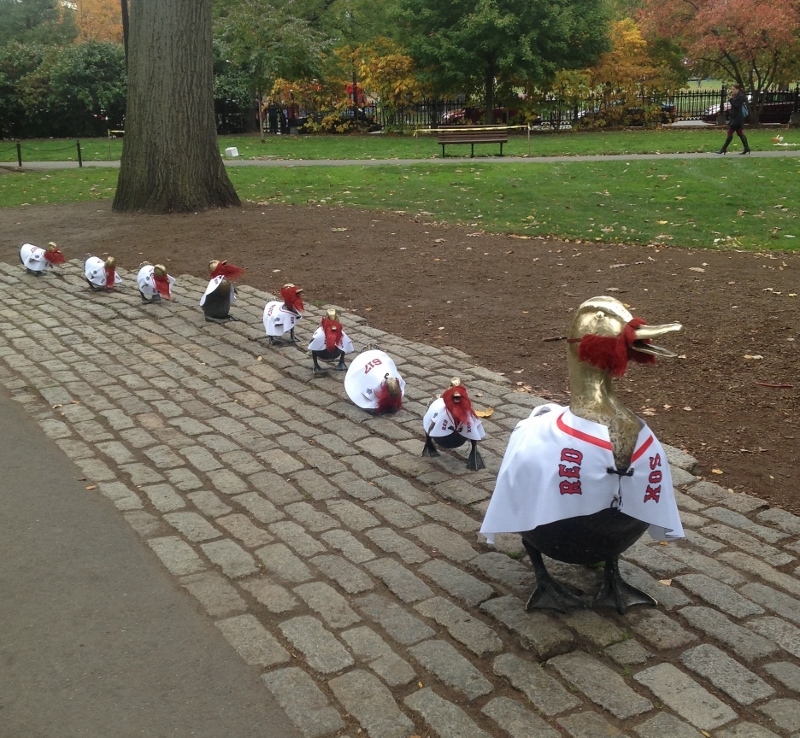 Even Mrs. Mallard and her ducklings have Red Sox fever! If the Red Sox sweep the Cardinals…and I’m not saying they will (I’m also not saying they won’t)…they will do it on the 9th anniversary of the night they won the 2004 World Series…against the Cardinals. I can dig that. I can also dig an umpiring crew that had no problem getting together and making the right call when one of their own completely messed it up. Much like they did twice in the 2004 ALCS. I find it fascinating that there are so many little connections to that postseason. Heck, even Tim Wakefield, Keith Foulke and Kevin Millar have all said this 2013 team reminds them a lot of the 2004 “idiots”. And tonight, although Fox Sports will most likely not show it, members of that 2004 team will be throwing out the first pitch. I’ll take the good karma anywhere I can get it. Last night’s win was made even more special by the fact that it was pretty much stress-free. The umps reverse a bad call, the Red Sox start scoring and we get a non-nail biting, World Series win behind a masterful performance by Jon Lester*. *Not even going to bother rehashing this morning’s whining about a possible substance on Lester’s glove. As many have said, what was or wasn’t in his glove didn’t cause the Cardinals to make 3 errors or force Cardinals pitching to give up 8 runs on 8 hits. I will say this in support of Cardinals fans: Throughout the ALCS, Red Sox fans complained because it seemed like not only did the Fox crew want the Tigers to win, but they talked more about and with the Tigers than the Red Sox during EVERY game, in Detroit AND Boston. Last night, aside from a bit of focus on Carlos Beltran, it was pretty much all Red Sox all night long. If I was rooting for St. Louis I’d be more than a little annoyed this morning that Fox made it out like only one team was playing. Fact: Lester and his Red Sox teammates have used BullFrog sunscreen, which, when mixed with rosin, creates a tacky substance that enhances a pitcher’s grip on the ball. BullFrog was seen in the Red Sox’s dugout during the division series at Tropicana Field – a domed stadium. Fact: Major League Baseball is well aware of this and does not consider it an issue despite rules about foreign substances because pitchers, hitters, coaches, managers and executives agree that a substance used to better a pitcher’s grip, as opposed to doctor a ball or make it dip and dive in unnatural directions, is within the confines of the rules. So let’s move on to tonight, shall we? The Red Sox, with John Lackey on the mound, have a very good opportunity to go up 2-0 in the World Series. 2-0. Rookie right-hander Michael Wacha will try to make that difficult for them, and if anyone on the team can put the hurt on the Red Sox he can, but we were told to worry about Adam Wainwright and look how that worked out! My hopes for this year were simple. I wanted them to win on Opening Day at Fenway and then give us an entertaining run that might include them flirting with first place for a while. When it became clear that they were a good team that was going to do more than flirt with first place, I wanted them to make the playoffs. When making the playoffs was a foregone conclusion, I wanted them to win the division. Once they ticked that off their to-do list, I wanted them to beat the Tampa Bay Rays. From there it became really simple. The Detroit Tigers were a damn good team and if they lost to them there would be no shame in it. I was already thrilled with the way the season went and I could hunker down for the winter content in knowing the team had shed the ghosts of fried chicken, beer and Bobby Valentine. Then they went and won the damn pennant and they were bringing us a rematch of 2004. I still don’t know what to do with this. I won’t consider this season a loss or a waste if they can’t win the World Series but after last night they got me hungry for it in a way I didn’t expect. 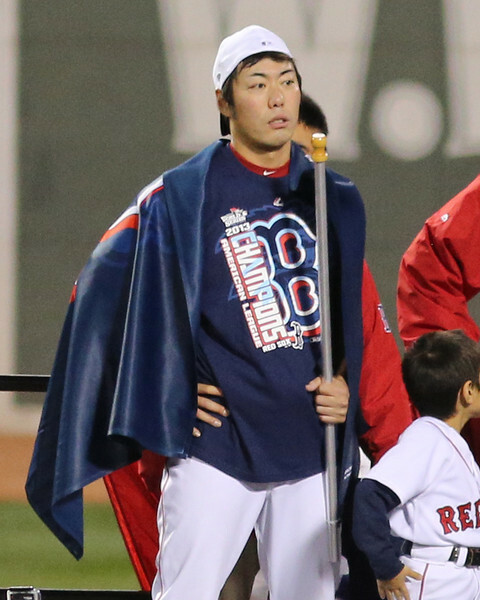 I want to see the Red Sox win…win the whole thing. And as much as I don’t look forward to there being no MLB until February, if they won it in four games it would be so very sweet. But I can’t get too far ahead of myself. Let’s work this one at a time. Lackey v Wacha. A pitcher rehabilitating his reputation against a pitcher just starting to form his. Lackey turned 35 yesterday and Wacha is 22…none of these things will matter once the first pitch is thrown tonight. So in the spirit of brevity, which I’ve already thrown out the window: Just win. Don't You Already "Like" the Dana-Farber Cancer Institute? 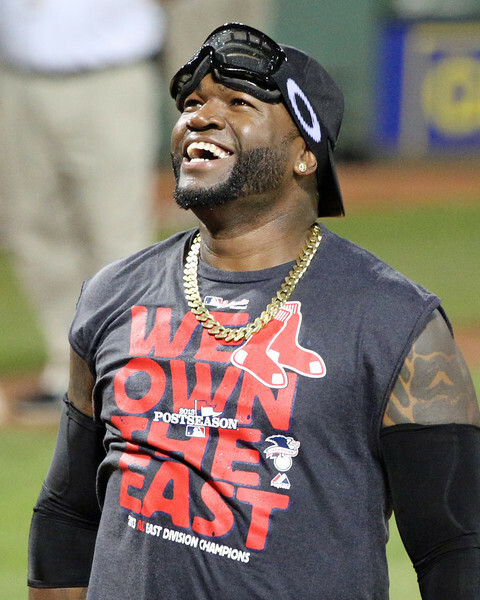 BOSTON—Would you love a chance to win an authentic Boston Red Sox home jersey signed by designated hitter David Ortiz? Then like Dana-Farber Cancer Institute on Facebook. Online now, and running through Friday, Nov. 1, people who “like” Dana-Farber on Facebook, will be entered to win the Ortiz autographed Red Sox jersey. Dana-Farber launched the contest to generate greater awareness about its online community on Facebook, which offers information for cancer patients and their families and friends, and provides an inside look at Dana-Farber, its services and programs, and its employees and volunteers. This year marks the 60th anniversary (#JFRedSox60) of the historic partnership between the Red Sox and the Jimmy Fund, which together support adult and pediatric cancer care and research at Dana-Farber. From Ted Williams to Mike Andrews to Mo Vaughn to Jarrod Saltalamacchia and Will Middlebrooks, Red Sox players have been quick to support the Jimmy Fund and Dana-Farber, including visiting patients at the clinics and helping with fundraising initiatives. The chance to win the autographed Ortiz jersey continues this tradition and is part of a season-long celebration of the 60th anniversary. Contest participants must be 18 years of age or older and a legal resident of one of the 50 United States or the District of Columbia as of the date of entry in order to be included in the drawing. No purchase is necessary and only one entry per participant is allowed. Official rules are available online here. The drawing will be held at 5 p.m. on Nov. 1. Dana-Farber Cancer Institute is a principal teaching affiliate of the Harvard Medical School and is among the leading cancer research and care centers in the United States. It is a founding member of the Dana-Farber/Harvard Cancer Center, designated a comprehensive cancer center by the National Cancer Institute. It provides adult cancer care with Brigham and Women’s Hospital as Dana-Farber/Brigham and Women’s Cancer Center and it provides pediatric care with Boston Children’s Hospital as Dana-Farber/Boston Children’s Cancer and Blood Disorders Center. Dana-Farber is the top ranked cancer center in New England, according to U.S. News & World Report, and one of the largest recipients among independent hospitals of National Cancer Institute and National Institutes of Health grant funding. Follow Dana-Farber on Facebook and on Twitter. I can’t believe today is only Tuesday. Even in the world of sports, I’m not one of those people who wishes time away…but the past two days have craaaawled by and the idea that we have to wait about 35 hours before another Red Sox game is scrambling my brains. So I’m pretty much useless today. Which gives me time to think…which isn’t always so great for other folks. Today I’m thinking about all of the fun police. Not just Brian McCann or the St. Louis Cardinals, but everyone who tries to tell you how to enjoy your sports experiences. You know who they are. They’re almost always people who cover the sport you love. They tell you that you’re wrong for cheering for a blown perfect game (“No true baseball fan wanted to see Carl Everett (ugh) get a hit.” Holy hell, Bob Ryan, I did. Sweet Jesus did I!) or they tell you that there is something wrong with an entire park of fans singing a song just because it has nothing to do with baseball. Some people make fun of folks giving and getting marriage proposals at a baseball game…as if the fans have a NERVE to want to enjoy the entire baseball experience. Now before I get called out, I have to come clean and admit that I often find myself being a member of the fun police. I hate the wave (why would you purposely do anything DURING the game that would 1. Block the view of other fans and 2. Potentially distract the team you’re there to support? ), I despise people bringing beach balls to the game (one of my proudest moments at Fenway was, without any kind of planning, stabbing one with a pen I happened to have in my hand as it landed on my lap) and if I saw a thunderstick or a towel being waved while I was at Fenway you might be reading about me getting arrested after I shoved one of them where the sun doesn’t shine on the waver. So I know that my annoyance with those who want to tell me (or you) how to enjoy the game comes with a bit of hypocrisy. My only defense is that the things that bother me are things that go on while the game is being played. I don’t care what you’re doing in the stands before or after the game or during breaks in play, but if your enjoyment of the game interferes with the enjoyment of others, or their ability to see the action on the field, I think you should look for something else to occupy your time. But generally speaking, I don’t think there should be any set rules for how to be a fan (except, again, don’t mess with everyone else’s fun and, most importantly, their view of the game) and I will never understand why so many people (read: sports writers) feel the need to tell people how they should act as fans. If I want to wear a fake beard to Fenway Park, I will. If I want to bring a glove because I would rather not get decapitated by a David Ortiz foul ball, I’m gonna. If I want to use my iPad to record 35,000+ people singing Sweet Caroline in a game that the Red Sox are losing, shut the hell up and get out of my way (or just start singing). I will be watching Game 1 of the World Series from the comfort and safety of my couch. This is probably for the best. So earlier this year the site had some major technical issues and I essentially lost all of my blog entries from 2012. At the time I didn’t mind much…sure my ego wants to save everything I write, especially the stuff I put a lot of thought into, even if they are just blog entries, but the part of my heart that holds everything baseball was almost happy that I had no written proof of my own about the year of Bobby Valentine. Now there is a part of me that wouldn’t mind re-reading some of that stuff because the contrast between how I (we?) felt last year and how I (we) feel this year is ridiculous. But I’m one who doesn’t believe in regrets, so on we move. Holy cow, people, the Red Sox are going to the World Series!!!! Over the next few days, hell over the next week, we’ll hear and read a lot about how a Red Sox/Cardinals World Series is boring; people will complain about the beards and we’ll have to endure Joe Buck and Tim McCarver for at least four games. Know what? All of it will be totally worth it. Without a doubt in my mind, regardless of the outcome, the next week of baseball will be the happiest I’ve had (WE’VE had?) since 2007. Not that a few of the years between then and now weren’t fun but the team that finished in last place…the team whose sold-out streak ended because people had just had enough…that team is going to the World Series. They won the East with the best record in the American League. The from the bottom to the top, from first to last, from losers to winners…all those story lines might sound contrived to those outside of Red Sox Nation* but we now what kind of misery we experienced between September of 2011 and September of 2012. 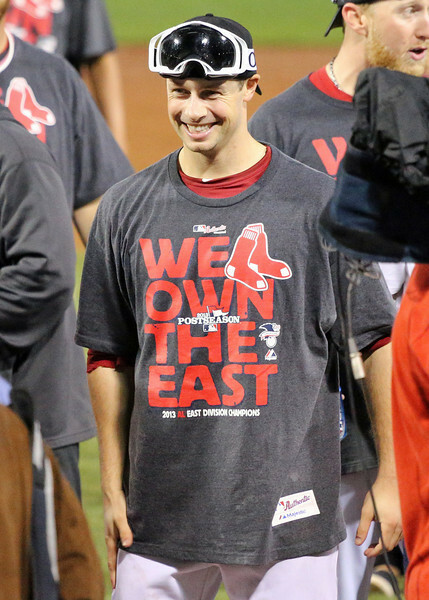 So those who think it’s just a cute way to introduce the rest of baseball to the 2013 Boston Red Sox can moan all they want because we know how difficult a road this was for both the fans and the team. * I don’t love the Red Sox Nation tag but my experiences with this blog and elsewhere on the Internet have taught me that it’s not completely without merit. Red Sox fans, GENUINE Red Sox fans are all over the country (and beyond) so for the purposes here I think Red Sox Nation is fitting. 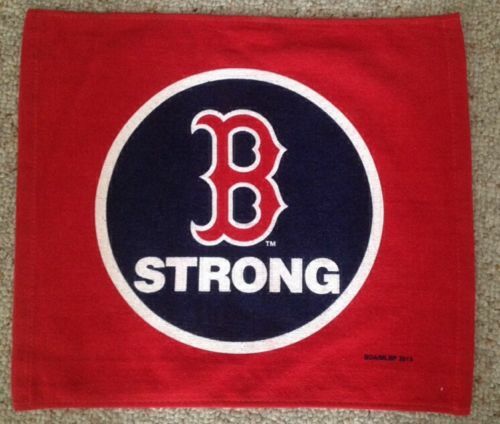 There are plenty of Red Sox fans who aren’t in New England who suffered as much as those of us here did. Both today and yesterday when I woke up my first thought was “I can’t believe Shane actually hit that grand slam!” The feelings about this postseason might not be as intense as 2004 but man they’re just as fun. And while I don’t expect the Red Sox to steamroll over the Cardinals, I do believe they’re going to win. Maybe not in a sweep, but I think they’ll do it. I feel like this is the year they win it at home. And I can’t friggin’ wait.